I review and provide my opinions about anything that comes to mind! I find it very important to plan ahead if you want to be able to enjoy your aquarium for a long time to come. Doing proper research will not only save you time, and money but also save you from frustrations which eventually leads to giving up. Nothing is worse than finding out months later that your fish has outgrown its home and needs a new tank. So before you plunk down your hard earn money, there are a few things you might want to consider. One of the most common questions in the hobby is “what tank size is good enough?” and the extreme hobbyist responds is more likely “the biggest size you can afford”. Though I agree with that answer, make sure you are realistic. For instance, if you can afford a 300 gallon tank, but only want to have small school of tetras, ideally a 10 gallon tank would suffice. Vice versa, if you can only afford a 10 gallon tank, then purchasing a Cichlid Oscar (over a foot long fully grown) wouldn’t be a smart purchase. So do your research on the fishes’ requirement so you may provide a suitable home for your new pet. The larger the tank, the more expensive everything else is. Heavier tank makes it more difficult to move. May require movers and a truck. This has been a hot topic in the hobby, while there are some advantages to owning one or the other, it doesn’t make a difference to the fish except for the size of the aquarium. So we will leave this debate for others. However, I will list some of the known advantages of having either. 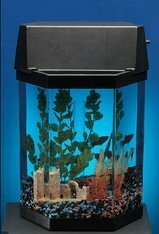 Today there are many different types of fish tanks in the market. 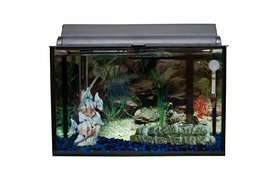 The fish tanks are made of plastic acrylic or glass. They also come in different shapes from a Fish Bowl to a Bow Front tank. 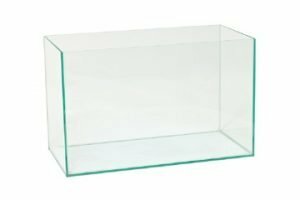 Each tank is suited for cosmetic reasons, and may provide more or lesser value for your fish’s needs. For instance, the Danio fish which is a very fast swimmer and routinely enjoys swimming back and forth. 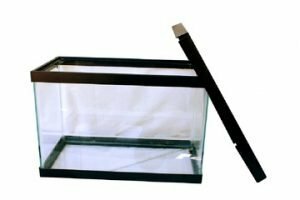 Therefore, the Danio would do better in the traditional rectangle tank verses the hexagon tank of the same size. So when you’re picking out a home for your fish, make sure you have taken the fish’s desires into consideration. This would avoid unnecessary stress for the fish, and a happy fish makes a happy owner. Keeping away from direct sunlightwill help eliminate excessive algae outbreak and rising water temperature. Placing your tank where there is less foot trafficwill help eliminate the possibility of stressing out your fish. However, if placed in a heavy footed traffic area, placing decorations and enough hiding place can help reduce the stress level of your fish. Keep in mind where the location of your aquarium is; inconsistently cool or hot areas can cause unstable water temperature. Having enough ventilation in the room is very important and can reduce the humidity levels. High humidity levels can be an issue, which can lead to mold growth. Humidifiers can help reduce high humidity levels. To leave enough room to access the back of the tank will allow room for maintenance. It is important before you fill your aquarium up with water, that you are sure how far away from the wall you want your aquarium to be. That there is enough power to avoid any circuit overload; with all the equipment needed to operate an aquarium, the last thing you want is a power outage. To be safe, a GFCI is very helpful and can save you from any danger. In the event of an overload or water detection, the GFCI will trip and cut out all power from the outlet. Last but not least, make sure that the floor where you are placing your aquarium is strong enough to support it. A fully loaded aquarium can be extremely heavy. A gallon of water weighs approximately 8 lbs, not including the weight of the aquarium, decorations, substrate and other items in the tank. To be safe, ensure that the aquarium is placed across multiple floor beams and closest to the wall foundation. If needed, without too much work, floor jacks may be used to provide additional support. Also, make sure that the water level is even as possible. You should purchase a leveler for measurement and wooden shims to help adjust any unevenness found by tucking it beneath the stand. Tip: Make sure you purchase a quality sturdy stand. From experience, I would research the stand you are purchasing for a peace of mind. To some, this may sound like an easy task. 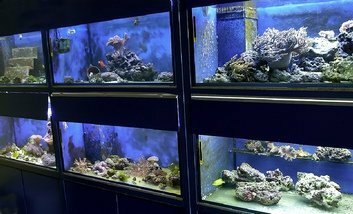 However, the task becomes much of a bigger challenge when the tank size exceeds 75 gallons, especially glass aquariums. This requires a vehicle large enough to accommodate the tank, enough padding and cushion to protect the tank from any damages while in transition and the proper handling technique. If it’s a large tank, make sure you have plan carefully how you are going to get that tank into the house. Be extremely careful when handling any size tank. Always carry from the bottom. Dollies, shoulder straps (evenly distributed), and enough people to help carry the load. Most importantly, be extra careful when handling a very large tank. The best advice is to get enough people to avoid any injuries. Rodrick on Pacquiao dominates Broner – Immediate Reaction!